The new Applebee’s is making sure that everyone is “Eatin’ Good in the Neighborhood.” It’s welcoming style makes this place perfect for a casual dinner with the whole family. Carretera Transpeninsular KM 29.5 s/n Plaza Peninsula Local 9-A Col. La Jolla San Jose del Cabo, BCS. Phone: (624) 172-6472. Offering international pub fare with a strong local influence. Burgers, onion rings, pizzas, steaks, seafood, sheppards pie, fresh salads, best french fries in Los Cabos and much much more. Next to Baan Thai in the Art District of San Jose Del Cabo, For Reservations: Ph. 146-9995. Offers an exceptional culinary experience. 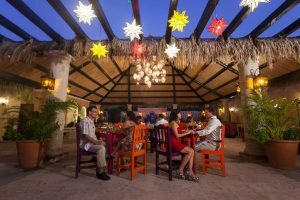 With an outstanding mix of products, contemporary techniques and Mexican flavors in San Jose del Cabo, Los Cabos. Bahia de Palmas s/n Loc. 2, 4 y 6, Col. Fonatur, San Jose del Cabo, Baja California Sur 23400, Phone: 52 624 142 5928 | Fax. 52 624 142 5929 | From USA 1 866 440-0073. El Azahar Restaurant – El Azahar restaurant wants to reveal the “New” México to its patrons, by providing a contemporary sparkle to the traditional Mexican style. Plaza Madrid, Ignacio Zaragoza s/n, between Guerroero and Degollado, San Jose del Cabo. Phone: (624) 130-7512; (624) 142-1454. El Fogon, Taqueria – has a big variety of tacos and quesadillas with some other Mexican specialties, Pastor style tacos. Manuel Doblado Ave s/n Col. Centro. San Jose del Cabo. Cell Phone: 624 132 – 8485. Open Daily from 8:20am to 2am.